I received this preview in an email, and figured that I might as well post it. 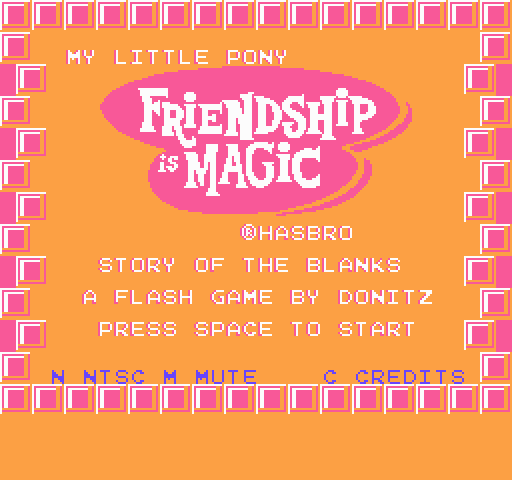 To be honest, I'm having trouble keeping up with all these pony RPGs under development right now. I keep getting them mixed up, with a whole bunch of them having similar premises and being "inspired by Zelda", and while there's nothing wrong with this, I personally wish for a bit more variety. Anyways, I hope you enjoy this video. I don't really have any details on the game right now, and I don't know the release date or anything like that, but like all other MLP fangames, I hope it gets finished. 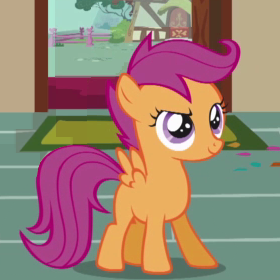 This one's for all you Scootaloo fans out there. The object of the game is simple: catch the Scootaloos falling from the sky, and use the bits earned from your played rounds to buy upgrades for your bucket or the Scootaloos, or even unlock a new game mode. 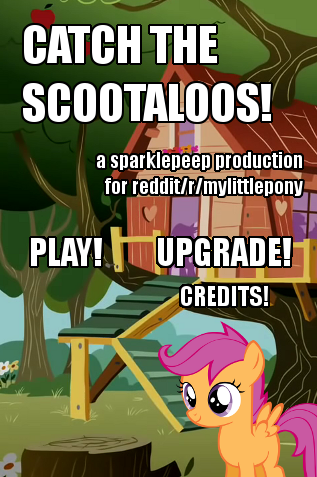 Credit to this game goes to Sparklepeep, who made this game for the r/mylittlepony community on Reddit. It was also featured on Equestria Daily, but I felt this game was in need of a proper review. Read it after the break! Speaking of banners and banner submission, we here at Equestria Gaming have decided to hold a banner contest, the first of its kind. Anyone can submit; you can even submit more than once if you want to. Just be sure to submit it by Saturday, January 21, 2012. Yes, we're announcing this pretty early, so if you want in, you have a big timeframe to work. At that point, I'll make a post with all the submissions, Equestria Daily style, and you all can vote on your favorites. The banner with the 4th highest number of votes will be the banner from February 1st to 7th. The 3rd highest banner will be showcased from the 8th to 14th, and so on, until the grand winner becomes the banner for the last week of February. Well, I updated the website's ageing banner. 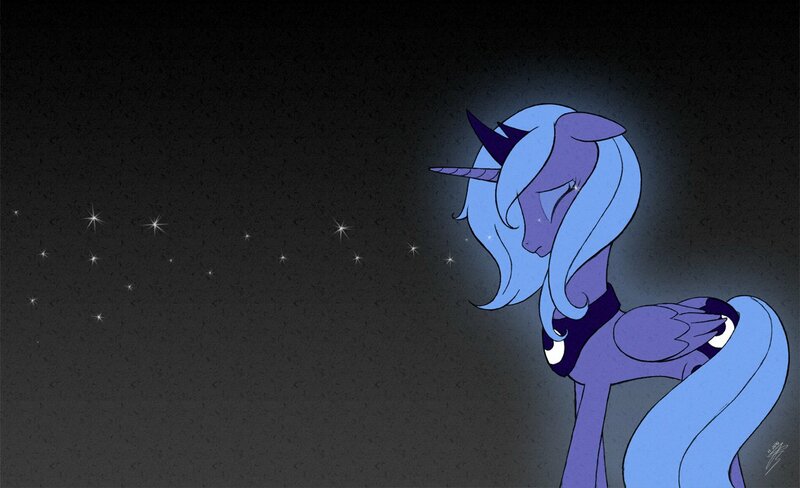 It's only temporary, and was drawn by the DeviantART user Equestria-Prevails. We'll be updating the banner regularly, and yes, in case you were wondering, you CAN submit banners if you wish. Well, apparently this Pony RPG trailer got featured on Equestria Daily, and I figured I might as well post this on Equestria Gaming. There are two more trailers after the break, in case you wanted to see more of the project. Now some of you may remember a video Cereal Velocity posted a while ago called Equestria Daily: The Game, which joked about how much email the Equestria Daily team has to deal with - hundreds of messages a day, if I'm not mistaken. 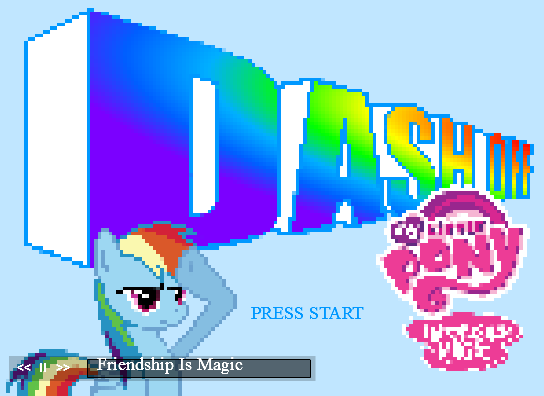 In case you missed the Equestria Daily post about this, it has been made into an actual game, currently being developed by Nitrouspony over on DeviantArt. This simple side-scrolling platformer is still being worked on - Nitrous is going to add many things to it, including an Android and IOS version. But you can play the current version now at the link above. Find out more after the break! Update:poll is over. Nightmare plot wins! The Legend of Celestia blog has updated, and apparently they have a poll that will help them decide which plot to go with! If I were you, I'd head over the to their blog at http://www.legendofcelestia.com/blog.html. Oh, and apparently they're releasing a video preview tomorrow. I won't be around then, but I should be able to provide a link on Monday (unless one of my fellow bloggers beats me to it, :P ). Well, I've been working on the site lately, fixing small errors and things like that, when suddenly I realized that we don't have a favicon. Please note that this is not final, and may be replaced later. I also plan on updating the site's banner; as it's getting rather old. You can email me submissions if you wish. "One fine day, when Applejack was walking innocently through the hills...suddenly, OWLBEARS! Thousands of them!" So begins the Pony Platforming Project, a simple platformer starring Applejack. It's developer, Mark Sprague, is a member of Mane 6, the dev team behind My Little Pony:Fighting is Magic. He also runs the webcomic Dragon Mango, which you may have heard of or read before. 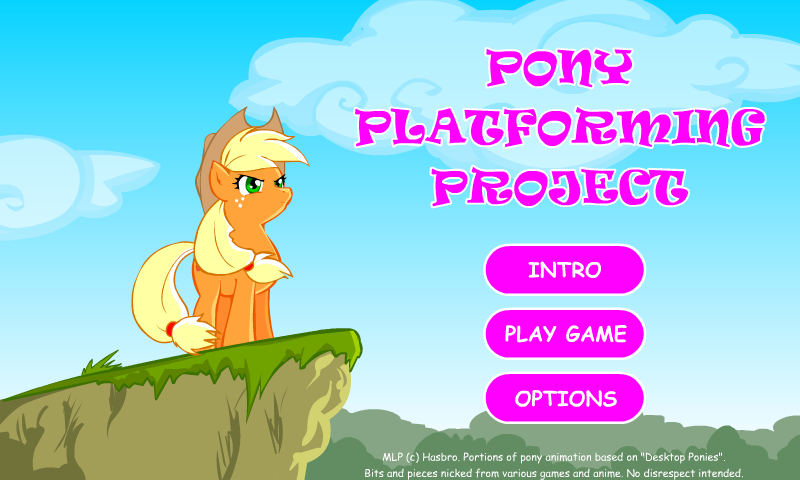 Does the Pony Platforming Project live up to it's creator's rather impressive résumé? Find out after the break! Until I can find someone to run it/post more, this site is on temporary hiatus. Sorry guys, there's just no time for it anymore. EDIT: Got someone new, we may see some posts on here after all! An official MLP game? In my Equestria Gaming? It's more likely than you think. Yeah, I know there have been games in the past we haven't touched on. 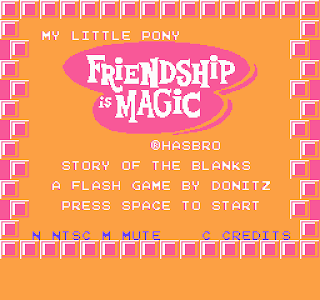 But to never discuss actual, official Friendship is Magic games would be sacrilege. Sacrilege, I tell you! 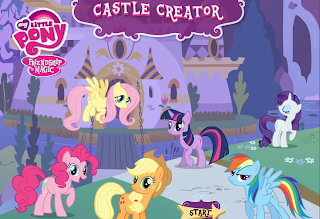 As such, it's about time to look at the Hub's new online game, Castle Creator. It's more or less an online playset, as you pick a location(such as the Grand Galloping Gala and Ponyville) and drag and drop characters into different poses, as well as adding items to the mix. All of these images are ripped directly from the show, so it feels far more like you're making a scene from an episode than it would if you were playing with toys. This obviously means it's designed for the show's intended audience, and while it's not something I could see myself investing any time in, it does a commendable job at creating something that its target will enjoy. While that's all there is to it game-wise, I would be remiss if I didn't bring up Derpy Hooves' now famous inclusion. Not unlike that drawing Lauren Faust made a while back, the file name for the absent minded Pegasus in the game is Derpy.swf. Either this means that the developers wanted to put a fun in-joke in for the bronies who would inevitably scour the game's data, or Hasbro has decided to make Derpy Hooves canon. Whatever the case, this story is definitely one to watch out for, as it could mean that other fan names for background characters might become canon. Not trying to predict the future or anything, but I could definitely see it happening. Anyone with fond memories of 90's LucasArts adventure games, listen up: Adam "takua108" Rezich is developing a brand new point-and-click engine called PonyQuest. 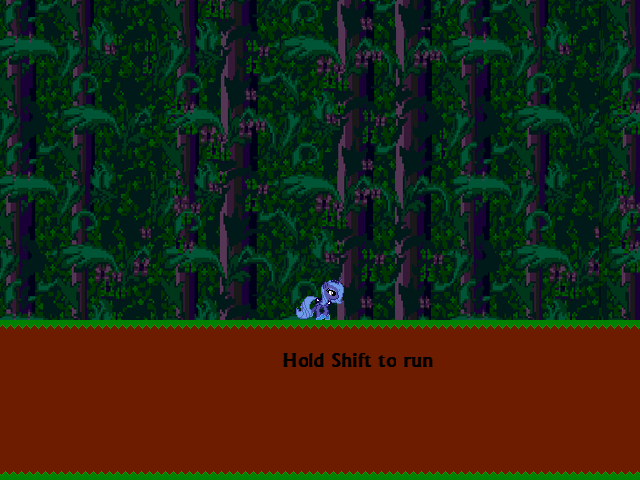 PonyQuest is designed to allow users to make their own DOS-esque pony adventures that can easily be shared with others. He's even making the scripting language, which he's dubbed PonyScript, simple to use so even people with no understanding of programming jargon can easily craft their own dialogue and cutscenes. With all the 25th anniversary celebration, I can't help but feel like I'm being spoiled with Zelda goodness this year, with Nintendo and its fans alike showing their devotion to the franchise in a big way. 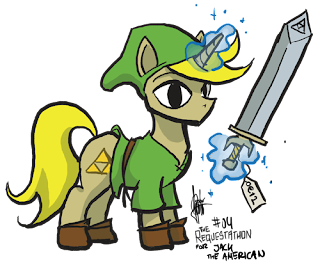 In fact, that MLP/Zelda project we reported on a while back has made some big progress recently. Check out the first gameplay footage! It appears to be making very good on its word to create a classic top-down Zelda experience with a distinct MLP feel. Check out more after the break. The Return of Harmony--er, Sapphire. I'm very sorry for my long absence. I've also been impacted by the wrath of college. I may have my work cut out for me academically and socially(trying to keep Twilight's wisdom in mind when making friends), but I'm finding it a bit easier to manage my time and so I thought it was a good as time as any to return. Expect updates soon! In fact, I should be working on my essay now rather than posting here. So as you can see, I haven't had ANY time to do anything with the site, and I'm in need of some help. The other guy who was supposed to be helping me hasn't been seen by me in a while, and I've got no one to help run this while I'm getting all my work done. I apologize for not being active, when I get my work all under control I'll try to be better, but until then I really need some help. shoot me an email if you think you can help, and if you want to help with posting and such, go ahead and include a quick review or news post so I can see if you're writing style works. An exciting new game project has popped up, a really neat looking 3D one. This game is currently being worked on by Byrpheros, and still in very early development. He's gone ahead and compiled a Document of Q&As that answer a lot of questions about the project. 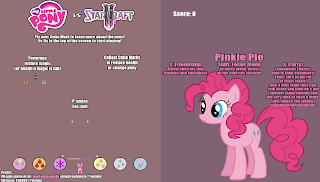 MLP Online is a fan made My Little Pony Friendship is Magic MMO, currently being produced by Urimas, Salty Justice, and their team of programmers, spriters, and other members in a custom made C++ engine. The project has been in development for a while now, and when finished, will be 100% free to play. Yes, I realize that this website has slowed down greatly in the amount of things it's been posting. But I have a reason, and hopefully soon it will be fixed. As most of you know, college/school for everyone is starting up, my college already started a week ago, so I've been overscheduled with classes and work. On top of that, we're about to be hit by a Hurricaine, and I have no idea if our power will last through it. The thing is, I need yours guys to help me until I can find the time to search around for all these things. If you find anything My Little Pony and Video Game related, ANYTHING at all, please email me about it. It can be a new guild somewhere that's popped up, a game you heard from a friend, or even something that was posted on Equestria Daily! But I need you guys to submit these things, I know this may sound a little demanding, but I really can't afford the time to do this all on my own. I would much rather have 10 people email me about the same game, than to miss it all together. MLP: FiM - Pony Creator is an advanced Pony creator programed in flash by generalzoi. 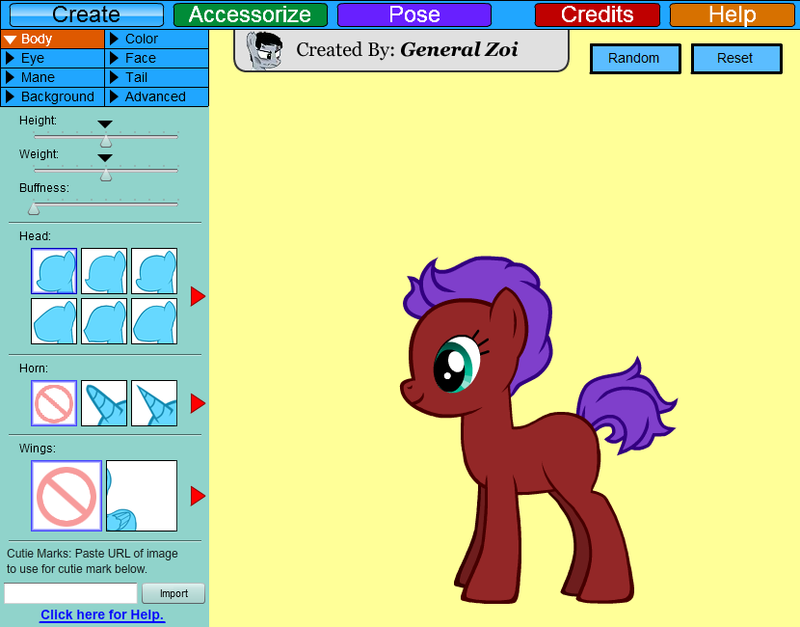 This game has no goal, allowing you to fully customize a pony of your own. Unlike other Pony creators, this one is extremely extensive! You can choose from a wide scale of different sizes and shapes for your pony, randing from filly to Slenderpony height. The colors for your pony's mane, coat, and tail are all full color scale. There are a bunch of different head shapes as well, allowing you to create either a male or a female pony. A full selection of Eyes, Expressions, mouthes, manes and tales, a cutie mark creator, custom poses, and accessories really makes this game stand out. Brony Day Terraria Giveaway! Deadline Change! 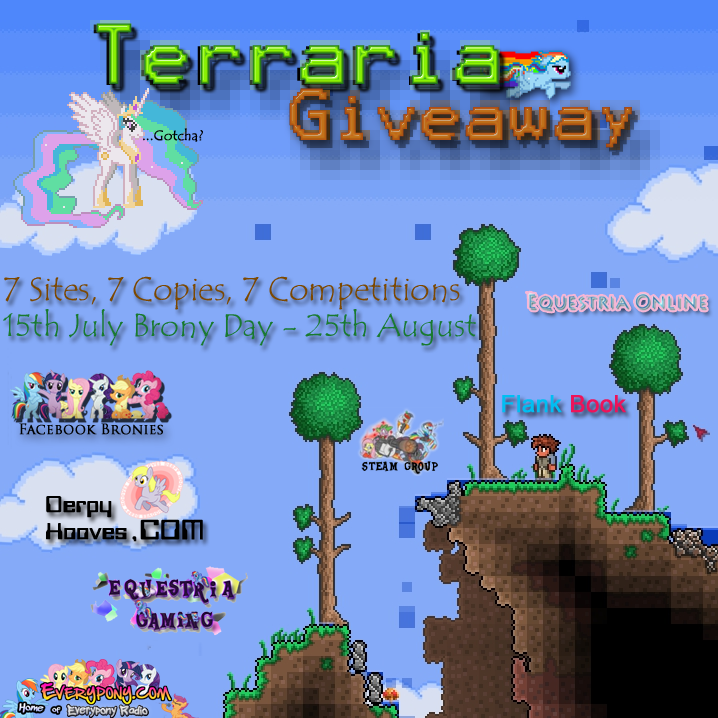 Me and a BUNCH of other sites are getting together and hosing 7 different contests for 7 copies of Terraria! 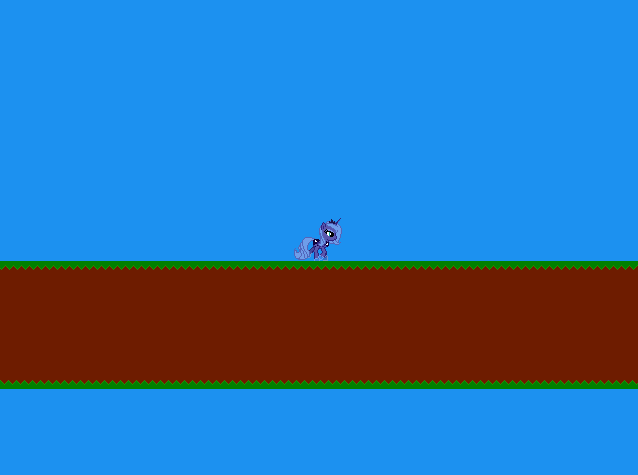 Make an 16-bit styled game with ponies! 2. The music can be anything, it doesn't have to be 16-bit, though it would fit best. 3. The deadline is September 15th (As of now, is still subject to change). 5. The title of the email should be "Game Contest"
6. You should include the author of the game, and preferably sources to your materials. Due to some confusion, only the sprites have to be 16-bit styled. It doesn't matter what you use to make it as long as it looks 16-bit. Have those games come right to me! 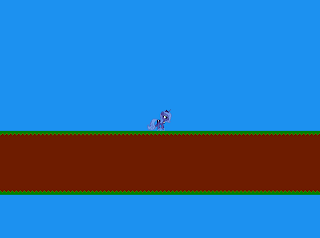 If you want, a good source to 16-bit pony sprites is the Desktop Ponies program. This will be the central post for the Brony Show Lets Plays in the future. Friendship Brigade is a gaming community that has recently popped up, they focus mainly on Non-Pony related games. You can check out the calender they have on the website for Game Dates, online meetups, and other gaming related events. The site is also the home to the MLG teams, which are (I believe) competitive teams that 'battle' other teams in online matches. So, ULTRAMARIOX asked the creator of the Luna Game series a few questions about the series, and got some answers back. You should head to the Ponychan Thread to read it. You can scroll past the first interview and read the second if the thread dies. After a long, long wait, the prequel to the Luna Game series has finally been released! 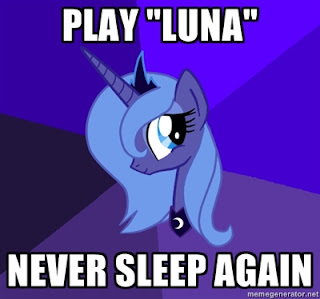 If you haven't already played Luna Game, Luna Game 2, Luna Game 3, and Luna Game 4 I suggest you go do that now. YOU CAN ONLY PLAY THIS GAME ONE TIME NORMALLY. I have received a program that allows you to play it again. It's just like the fourth one, you can only play it one time normally. 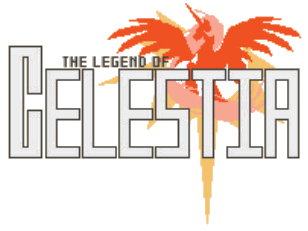 Legend of Celestia - Music Update! Recently, I was notified about an upcoming Legend of Zelda Pony crossover game! The project sounds very interesting, but they're in need of some people for the team! Right now the applications for being a part of the team are being denied until further notice, the team is full! But don't give up, they may need help in the future! 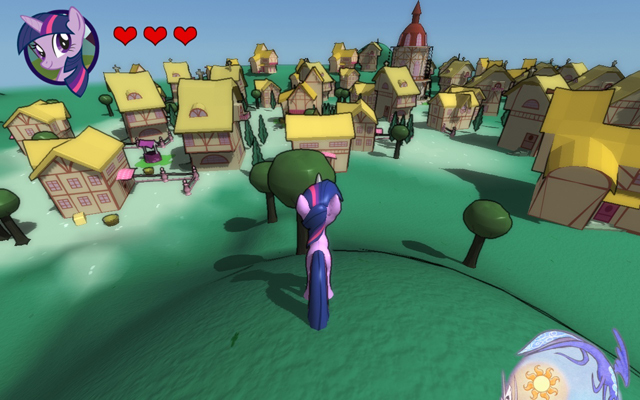 Equestria Online is a 3D My Little Pony Friendship is Magic MMO in progress. The current releases are being developed in Unity, though the team has not decided whether to use Unity 3D or Panda 3D for the game. Okay, so I organized and hosted the Brony meetup at this year's Otakon. And things couldn't have gone better! That's right! I'll be attending this year's Otakon! And even better, I'm organizing a Brony Meetup there! Now I already announced this a few months back, but Otakon is in a few weeks, so here are all the details! ALSO, THERE ARE TWO COSPLAY MEETUPS! As the title suggests, this game is heavily influenced by the Touhou series: A long-running “bullet hell” shmup franchise with a cult following. 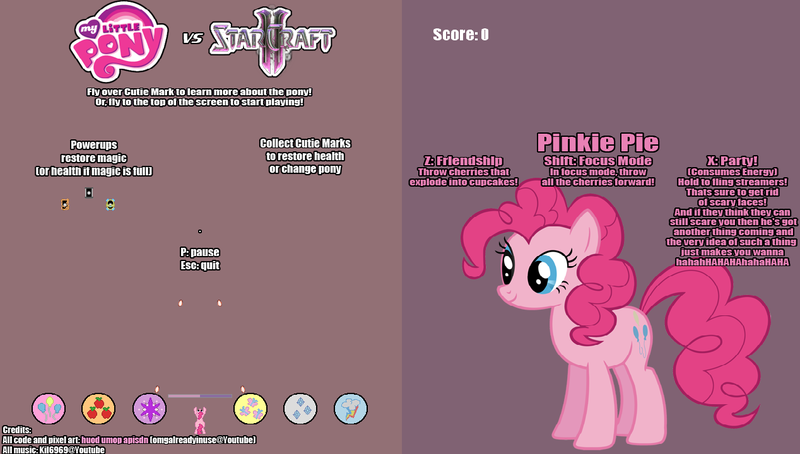 However, the title has a bit of an identity crisis- the in-game title is actually My Little Pony vs. Starcraft II, as the enemies seem to be inspired by that game. Personally, I think putting the two titles together with a colon in between would have made more sense. Odd title aside, does the game live up to its legendary inspiration? Hit the jump to find out. I want to give a warm welcome to Sapphire Feather! I met him at BroNYCon, and he said he was interested in being a reporter for EqG, so I asked him to send me a review. And well, he did! And it was absolutely brilliant! So congratulations to him, you'll be seeing some of his posts around now! I don't really have much more to say about it, other than look forward to his reviews! 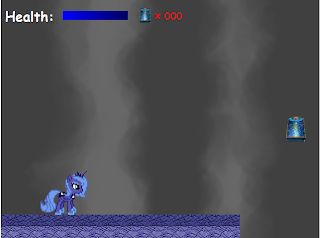 A new platformer featuring everypony's favorite baby dragon, Spike, has recently popped up. 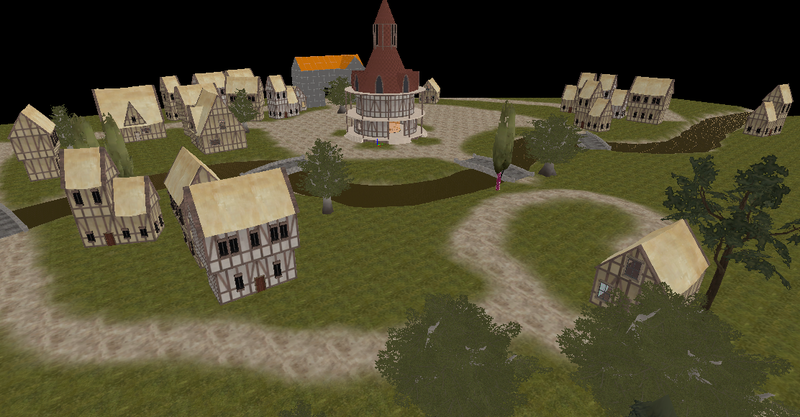 At the moment, the game is still in it's very early stages, but already looks very promising. The creator wants to follow a story line where the mane 6 are captured by the Diamond Dogs, and it's up to our heroic little dragon to save them! I left singing winter wrap up with three pony necklaces and four commissions in hand. Pics and more stuff after the break. No More Posts Until Sunday! Alright, a few of you may know this, but I will be attending this July BroNYCon (tomorrow). This means I won't be updating any more until this Sunday. But honestly, I still feel like I'm missing a lot of gaming news. With all the things I'm doing IRL, I haven't had much time to search for stuff, and you guys really need to tell me when things happen. Even if it's a post on EqD, email me about it. PLEASE. 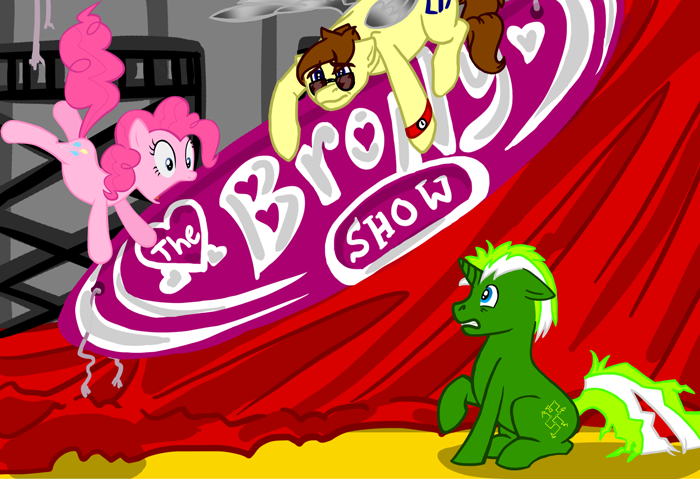 The weekly live cast of the big 10th episode for The Brony Show is tonight! Have some copypaste. 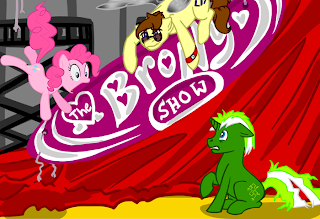 The Brony Show will be having their 10th episode live today at 6PM Pacific - 9PM Eastern. You can find the live stream on our front page link at http://thebronyshow.net. We'll be interviewing part of the team behind the flash game My Little Pony: Friendship is Magic. The Fiends of Dream Valley. We also have an interview with Sir Sprinkles of Brony Movie Night to talk about a new streaming event they're doing. Along with all the news, fan content, and hilarious randomness that only The Brony Show can bring! Go listen to some pony! The Luna Game now has it's own website. Pony Guilds and Servers Reminder! 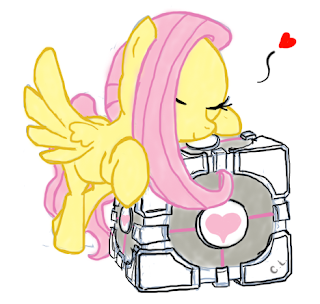 Just throwing out a reminder to you all, there is a pretty large list of guilds and servers especially for ponies! 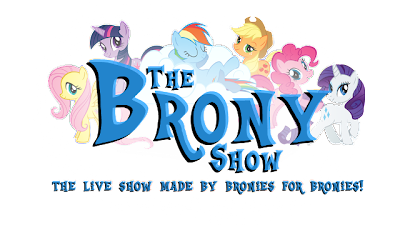 So go to http://www.livestream.com/thebronyshow right now! So the next game in the Luna Game series is underway, but this time it seems we're going backwards! Based on the name, and the things that go on in game, I'd say the next game is going to be a prequel to the series, and may explain a few things about the story behind the series. If you aren't familiar with the series, you can play all the games HERE. Below the Break is a bunch of spoilers. A few Bronies are trying to pull off something insane. A 24 hour steam of Minecraft. 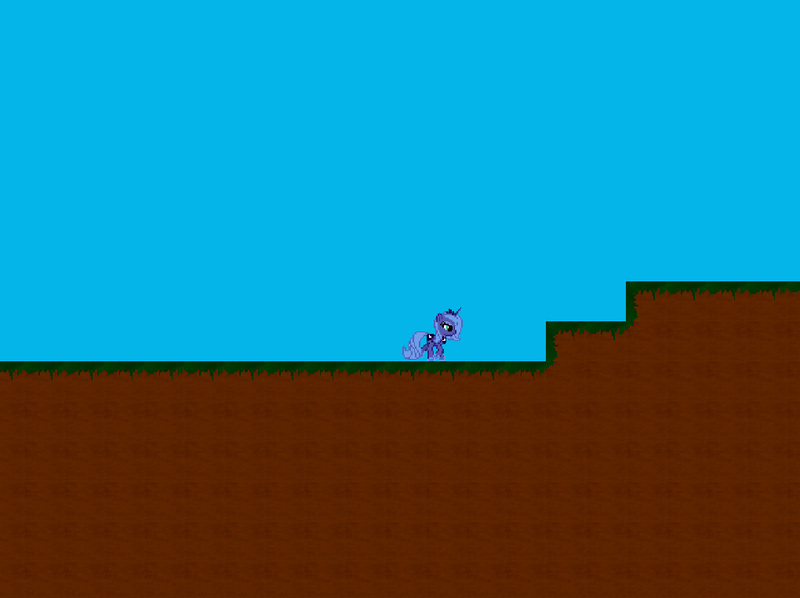 Now this has little to do with actual MLP: FiM, but they're Bronies, and Minecraft is a game, so I figured, meh, whatevs. I say, go check it out to see them pull it off. And if they do, hopefully listen to their crazy conversations after not sleeping for a whole day. Story of the Blanks is an 8-bit styled creepy game. This was the winner of the Creepypasta Game Contest, and well known for it's creepy and slightly disturbing storyline. The game itself features music by CRTified Technician, Zero V2, and DarkNES. Thanks to everypony who participated, the winner has been decided as Donitz with Story of the Blanks. I will be linking the EqG article as soon as I finish it. Alright, I'm sure many of you know about Luna Game and Luna Game 2. Both games are pretty creepy, but I crave for more. And what better way to get people to make creepy games than bribe them with free stuff? 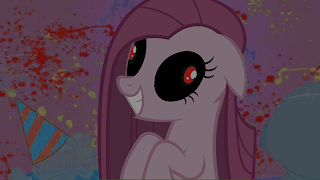 This month's contest will be to create the creepiest creepypasta pony game that you can. Also, I HAVE decided that I will hold monthly contests, each will likely have the same $10 game on steam prize, but I might mix things up some months. Alright, after a long wait, the fourth addition to the Luna Game series has been released! If you haven't already played Luna Game, Luna Game 2, and Luna Game 3, I suggest you go do that now. Though thanks to a user who emailed me, a program was created that allowed you to replay the game. Yes, I'm being completely serious, I couldn't even grab a screenshot on my own because I didn't realize this until AFTER I had played through it (Stole this one from Ponychan). This game is by far the best of the four, so I suggest you play it. I'll throw the link before the break this time, making it easier to play it without spoilers. 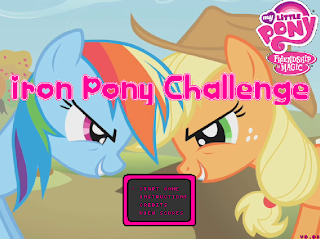 Iron Pony Challenge, a new pony game in progress by JinrohDev, is a game featuring many different mini-games, where you can play as either Rainbow Dash or Applajack. The music featured so far in the game is the main My Little Pony Theme. The current three games you can play are Pony Longjump, Rainball Bounce, and Hoofball Punt. In the future, you will be able to play as either Applejack or Rainbow Dash, but for now, only Rainbow Dash is supported. Each game has it's own control scheme (It's highly suggested you read the instructions before playing), but the goal is the same: Get the highest score possible. There IS a high score table, so you can compare your score to others, and see just how well you did. Anquestria is built on the open-source game "Angband", which is a 'roguelike' RPG. The game has a very simplistic look to it, using the built in windows symbols as the graphics, similar to Dwarf Fortress. The game is still in development, but is currently at a playable state. The game itself has to be run on a Windows system, though the source code can be found on the website to compile it for other systems. Alright, so here is July's Contest! This one will be a tad different than the last two. This time, it's an art contest! Now, for the specifics. The picture has to relate to, in some way, this website (Equestria Gaming), and be video game related. It can be pretty much anything, as long as you find some way to plop this in it. I would suggest drawing an image about Ponies and Video games, then putting the EqG thing in somehow last minute (like, lets say you make a cool Fallout picture, and just plop something Equestria Gaming on a billboard, or on a tiny candy wrapper somewhere, or a television, or a book). Somepony, known by the name Hawf, has recently started development on a Ponyville replica map for Team Fortress 2! This will be the first complete Ponyville map for Team Fortress 2 so far. The creator of this is going to try to keep the map as true as he can to Ponyville, while including as many of the ponyville hotspots. This blog is getting kinda big, fairly quickly. And I'm sure I can handle it alone for a while, but planning way ahead is what I try to do, makes things easier in the future! 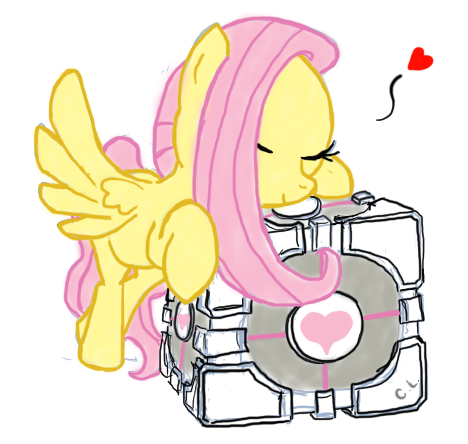 Anyway, I'm looking for someone else to help with reviews, and news posts with Pony Games! That was an AMAZING WEEK. But now I have tons of catching up to do. The next few days are going to be kinda crazy here. Woohoo! Well, I don't have very much time. I'm about to leave on my trip, so this will likely be my last post for a week. I'll re-do this properly when I get back! Wow! 100,000 Views! That's like, a whole freaking lot! First off, I want to thank a few sites. Derpyhooves.com for being there since the start, about three months ago when I first started this site, he was the first to link and support my website. Also, to the Steam Group, the Brony Facebook Page, and Everypony Radio for being awesome affiliates and groups. Anyway, enough thanks, I have a few things to say. 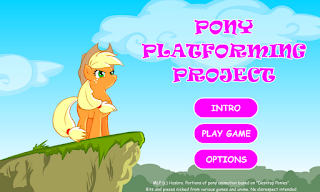 Holiday in Ponyville is a work in progress game, features the mane 6 ponies from the show. 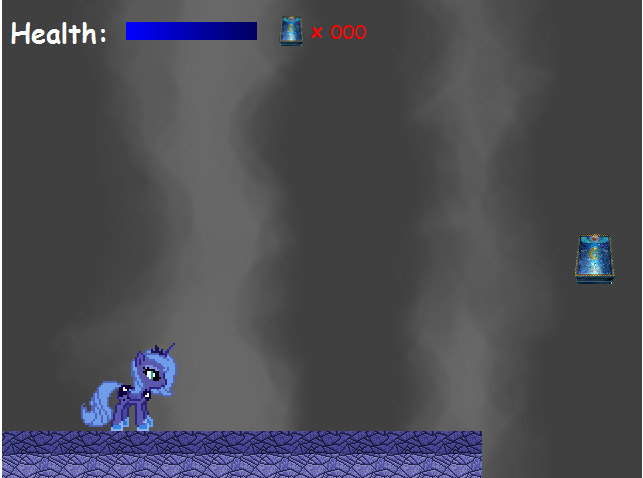 The game will consist of various mini games, one per pony for each day, and the more you complete in a day, the better! 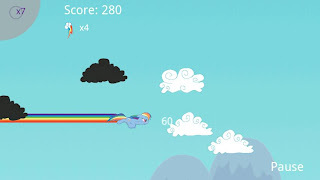 An example of a mini game would be helping Fluttershy with the rabbits or Rainbow Dash to keep the sky clear. 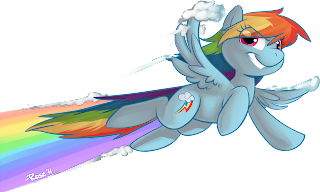 Dash Off is a platformer created by distoorted where you play as Rainbow Dash. The music featured in this game is the Entire 8-Bit Collection by RainbowCrash88. 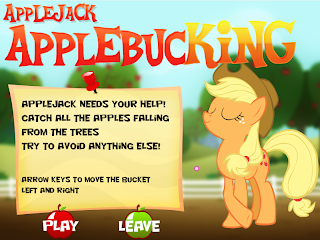 This goal of the game is simple, collect as many apples as you can before the time runs out. To collect the apples, you can run by holding either the left or right arrow key, and fly with either the spacebar or the up arrow. You have a Power Bar that regenerates itself over time, and if the power bar reached zero, you are unable to fly. Along the way, you do run into a few obstacles, but also a pretty nifty power up. 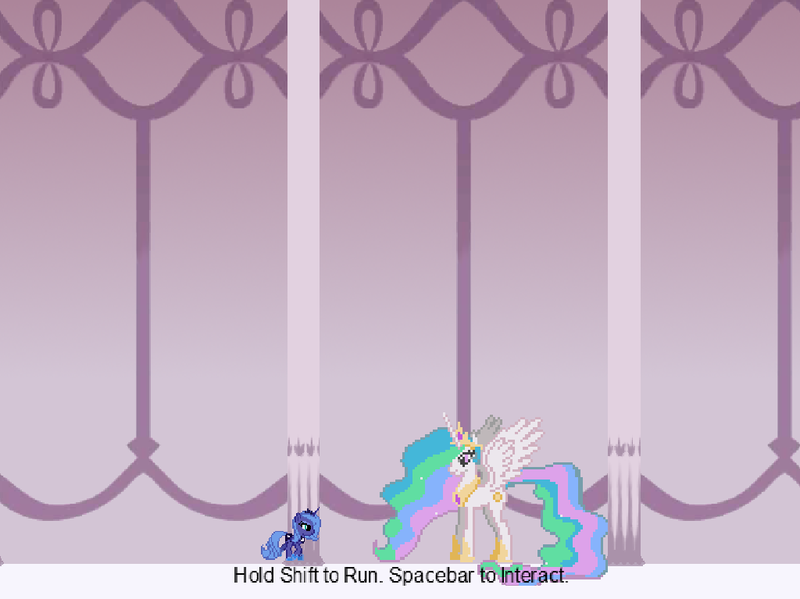 Well, I finally decided to make an Equestria Gaming facebook page! I'll be posting news updates, along with some other things there! And please continue to keep me updated with all the Pony Guilds, Servers and Mods, as well as Any New Pony Games or Gaming News. Once again, another mysterious email popped into my inbox. It was by the same address of the Luna Game 2. I'm sure all of you know by now of Luna Game and Luna Game 2. Surprisingly enough, this was not an entry for my Creepy Game Contest, just an anonymous posting of a game. Once again, I scanned the hell outta this thing with every virus scanner I had, and after playing it, it doesn't alter or create any files. The music featured in this game is Super Ponybeat - At The Gala.